2013 has been a really amazing year… despite many hard lessons learned. It was full of love and adventure and successes and yes… loss and heartbreak too. But I wouldn’t change a thing. Actually… that’s not true. I would change one thing. But I’ll get to that later. This year… my girls turned 8 and 9. Allison is in 2nd grade and Rachel is in 4th. It’s hard to believe that they’re already so old. It feels as is they were just 2 and 3 yesterday. Allison is an excellent student and in the advanced reading program at school. She’s outgoing and witty. She has overcome so much while dealing with her Diabetes. I know that that it has made her a stronger and more mature little girl. Rachel struggled much of her school career up until this year. She earned a B in Math… which I never thought would be possible. I’m so proud of how far she has come! Her sweet, sensitive spirit allows her to easily make friends and is quick to offer up a good laugh. Let’s talk about me. I focused in on my health this year. I took up kickboxing late last year and built up a good foundation. Soon enough… I was running! This year… I ran my first 5K and I had a personal best mile during that run. I started hiking and I really like it! I worked with a personal trainer and learned that I am much stronger than I thought I could ever be at 35. Strength. That’s something that I put aside while I battled some demons this year. Why would I ever set my strength aside while I was battling demons? I don’t know. But before all of that… I fell in love. I don’t share my heart on this blog. Ever. But this was a huge part of my year and as my friends… you should know that I experienced love. And this love ran its course. And I learned from it. I learned that I am capable of loving another person with all of my being and I learned that I am deserving of being loved. Oh. And I learned that there’s a time to let go. That was probably the hardest lesson of this year because while I was attempting to learn to let go… I battled my own fears of loneliness. And those fears won. This year… I hit rock bottom. I really did. It’s safe to say that I was clinically depressed. Not because of the loss of my relationship but by the overwhelming feeling of my first holiday season alone. A dear friend told me that I would feel those feelings and it was ok to feel them… but I spent so much time wallowing in my feelings of sadness that I let it take control. I became consumed with finding reassurances… filling all of my alone time with the comfort of a phone call or a text. I ended up taking advantage of someone who really cares about me. This is the one thing I wish I could do over. I hope that in time… I can show that I’ve learned a great deal from this and although I’m imperfect and still growing… I’m still a caring friend. I learned that I can’t rely on another person to make me happy. I have to be happy in myself. And I am now. I’m pleased to report that I’ve found my strength again. I’m proud. I feel successful in battling this demon of loneliness. But it wasn’t easy. It took some serious tough love to grow from the very pit of loss and despair. And I’d be remiss if I didn’t thank my friend Cassandra. Cass has been my voice of reason. Sometimes it hurt to hear the things I needed to hear… but along with that healthy dose of reality… she brought kindness and love to the table (and a bottle of wine). She let me whine. She let me vent. She let me cry. She listened and she provided a much needed shoulder. Of course I have a dozen other people that I could thank in this post for their love and support… but you know who you are. In 2013, I connected with my people. That’s you. I shared in your joys and your sorrows. I watched you grow in your careers, get married, get divorced, have babies, move away… This year… I really feel as if I was a part of the conversation. A contributor. A listener. A friend. And I hope that I can continue that trend in 2014. There are new battles ahead. Health battles I’m not ready to talk about yet. Career battles. Finance battles. But I’m ready if you are. Coming up with stocking stuffer ideas for people who don’t care about play dough or crayons anymore can be tough! Over the last few years… I started giving gift cards for small things. Like… $5 or $10 to a specialty store or fast food restaurant. This Saturday night, December 14th, SONIC Drive-In is having a Twitter party with Orange County Choppers! I’m going to help host it along with Rita from MomWitha.com! 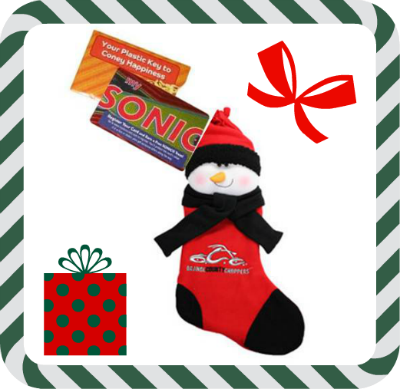 We’ll be giving away SONIC gift cards and some really fun OCC merchandise. I would love for you to join us! Following the Twitter party… we’ll hop right into the newest Orange County Choppers Episode with even more prizes! Some of you might be new to Twitter parties and aren’t really sure how to play along. It’s really easy! All you need to do is log into Twitter and follow along with the hashtags #orangecountychoppers #sonic. (I know… it’s kind of long… but really fun none-the-less!) To participate… you just join in the conversation! We’ll be asking some fun holiday questions and hearing from all of you about your holiday traditions! So… Tune into #orangecountychoppers #sonic on Twitter at 8pm ET this Saturday, December 14th! Oh and… RSVP here… so I can keep an eye out for you!